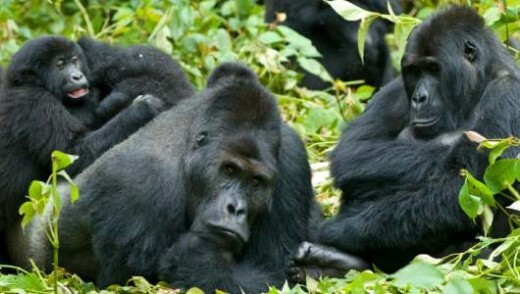 Scientists have shown that gorillas live in complex social groups, display individual personalities, make and use tools, and show emotions like grief and compassion. We shouldn't be surprised though - Gorillas are one of our closest living relatives, and they share at least 95% of their DNA with humans. African apes (gorillas, chimpanzees and bonobos) diverged from a common ancestor about 5 million years ago and belong to the family Hominidae. Gorillas are one of our closest living relatives, after chimpanzees and bonobos. They share between 95% and 99% of our DNA! Gorillas and chimpanzees walk quadrupedally (on all fours) and use their knuckles to carry the weight of their head and torso. There are two different gorilla species (each with two sub-species). The Western Gorilla (Gorilla gorilla) has the sub-species: Western Lowland Gorilla (Gorilla gorilla gorilla) and Cross River Gorilla (Gorilla gorilla diehli); while the Eastern Gorilla (Gorilla beringei) has the sub-species: Mountain Gorilla (Gorilla beringei beringei) and Eastern Lowland Gorilla (Gorilla beringei graueri). All species are endangered due to habitat loss and hunting amongst other threats, however the Cross River Gorilla is the rarest with fewer than 300 wild individuals remaining in eight small isolated populations in Nigeria and Cameroon. Scientist have shown that gorillas display individual personalities. Gorillas have been observed displaying emotions such as grief and compassion for other primates, including humans. Gorillas live in fairly stable social groups comprising of one adult male usually referred to as the silverback (because of the silver hair on his back which signals full adulthood) and multiple females with juveniles and infants. When young males reach the age of 8-11 they will usually emigrate away and either join another group or form new groups. Gorillas will groom each other by combing each other with their fingers and teeth. This ‘social grooming’ is an important aspect of gorilla groups which helps to establish and reinforce social bonds. Gorillas are mainly herbivorous, with the majority of their diet consisting of leaves, shoots and stems, some fruit and some small animal prey such as grubs, caterpillars, snails, termites and ants. Western Lowland gorilla diets have a much higher proportion of fruit. Females will start giving birth at about 10 years old and will have offspring every 3-4 years. When in oestrus she will be able to conceive for only three days in the month. Gorillas have a gestation period of nine months like humans, but babies usually weigh less than humans at approximately 4 pounds, their development is however roughly twice as fast. Gorillas spend a good deal of their time on the ground rather than in the trees, and will make new nests on the ground each night. Gorillas were seen for the first time using simple tools to perform tasks in the wild in 2005. They were observed using sticks to test the depth of muddy water and to cross swampy areas. In Mountain gorillas, the ‘belch vocalization’ is a contact call and sign of contentment while foraging. Most gorillas will use a low grumbling sound to both locate each other and as sign of contentment. Aggressive displays, such as the beating of chests and charging are quite rare but will be used by male gorillas as a warning if surprised or threatened. Although gorillas are generally quiet, they have a range of complex vocalisations which are used to communicate information in numerous contexts including teaching survival skills to young, searching for food, and during courtship. Like some other apes such as chimpanzees and orangutans they are even capable of learning basic human sign language.